If somebody had come to me this morning and told me The Beatles' Revolver is a great album, I would have said, "Of course it is, you ninny. What do you take me for?" And yet this afternoon, here I am to tell you what a great album Revolver is. Revolver is one great album. Great for many reasons; obviously for the individual excellence of the fourteen songs and the musical ground they cover, and all in thirty four minutes, fifty two seconds--now that's economy. Key to keeping the droning tabla on "Love to You" in harmony with the submarine and party sound effects on "Yellow Submarine" and the weird birdcalls and backward guitars on "Tomorrow Never Knows" are Paul McCartneyÕs contributions. As with his Sgt. Pepper's Lonely Hearts Club Band conceit the following year, McCartney provided a solid, classic pop base from which dizzying experiments like "She Said She Said" (on Revolver) or "A Day in the Life" (on Sgt. Pepper) could be launched. Unlike the Sgt. 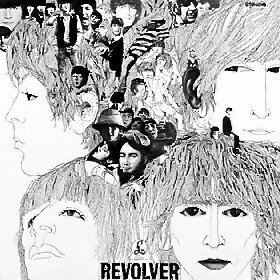 Pepper idea, which musically bookends the album, his songs on Revolver hold the record together by telling a story in five parts. The plot is not groundbreaking: introduction ("Eleanor Rigby"), boy meets girl ("Here, There and Everywhere"), boy gets girl ("Good Day Sunshine"), boy loses girl ("For No One"), boy gets girl back ("Got to Get You Into My Life"). But what drama! Strings on a pop song was a novelty when "Eleanor Rigby" was produced, but Paul and producer George Martin imitated a familiar source, film composer Bernard Herrmann. The arrangement is heavy, percussive, recalling Robert Mitchum menacing a family in Cape Fear, or Janet Leigh fleeing Phoenix in Psycho. "Rigby" sets the scene and the stakes: in this world of people who die alone the goal is to avoid becoming like lonely celibates Eleanor or Father McKenzie. The urgency of "Eleanor Rigby" is supplanted by the wonder in "Here, There and Everywhere." Although my opinions on romance occasion bemused snickers from virtually everybody I know, I'll go ahead and state it: "Here, There and Everywhere" is one of the top ten love songs ever (I haven't decided what the others would be, I'll have to get back to you). It has the spare, formal structure of a legal brief written by e.e. cummings. Notice how he links the end of the first phrase with the first word of the next to announce it as the subject of the verse? He does it again: ...Nobody can deny that there's something there. Article Two: There, running my hands through her hair. Watching her eyes, and hoping I'm always there. "Everywhere," the amalgamation of here and there--the place and the event that would subsume the world--is not quite reached in the song's narrative. But as I'm sure you noticed, the letters "H E R" are in each of the words "here," "there," and "everywhere," and that all of the strong rhymes in the song correspond with either those words ("hair," "care," "share,") or "I" ("beside," "eyes," "dies"), thus creating a constant, subtle interaction between "her" and "I" that comes close to fulfilling the exclusive ideal. The connection is celebrated in "Good Day Sunshine." Still, there is that someone speaking (Article 2, line 3) that she doesn't acknowledge, the suggested presence of a former lover, and bad news for the singer. "I'm in love and it's a sunny day" from "Good Day Sunshine" becomes "Your day breaks, your mind aches" in "For No One," which chronicles the relationship in decline. The tender conversation between "her" and "I" in "Here, There and Everywhere" becomes a stern lecture in third person to "you" on the subject of "she." The singer of "For No One" is too wishful ("a love that should have lasted years!") and too sensitive to the male half of the relationship ("You want her, you need her/ And yet you don't believe her when she said/ Your love is dead, you think she needs you") to be anyone other than the singer of the previous songs, but changed. He has become a ghost in the home he imagined would contain their love ("To lead a better life I need my home to be here"), the home she has abandoned ("You stay home, she goes out"). He smarts with nostalgia, but she has become a blank: no longer, no-thing, no sign, no one. ...and the forward thinking imperative of the title: Got to get you into my life. The song is the antidote to "Eleanor Rigby." Nervous strings are replaced by euphoric horns, and every stage of the affair is recounted with insistent optimism. I was alone, but I fixed that. You left me, but I knew it wasn't forever. Where "Rigby" ends with a final dark chord, "Got to Get You" trails off with the jubilant shouts of somebody embarking on a romantic quest, "Suddenly I see you! Did I tell you I need you? Every single day!" I am as familiar with the songs on Revolver as any ever written. Still, after not having listened to them for years in some cases, I was taken aback when I heard "Eleanor Rigby" on Partick's Yellow Submarine DVD a couple of weeks ago. As your friend and cobra, I urge you to run to your cd collection and re-encounter this masterpiece (if you don't have Revolver on cd, give yourself a talking to then run to Tower and buy it right now). It's glorious music, and you should have it here, there, and everywhere.